Sales funnels have been around since the beginning of business itself, and now everything can be tracked, analyzed and specific to each businesses’ unique needs. A key part of any successful business is the implementation of a solid sales funnel. Most businesses will have multiple funnels focusing on different sales goals. 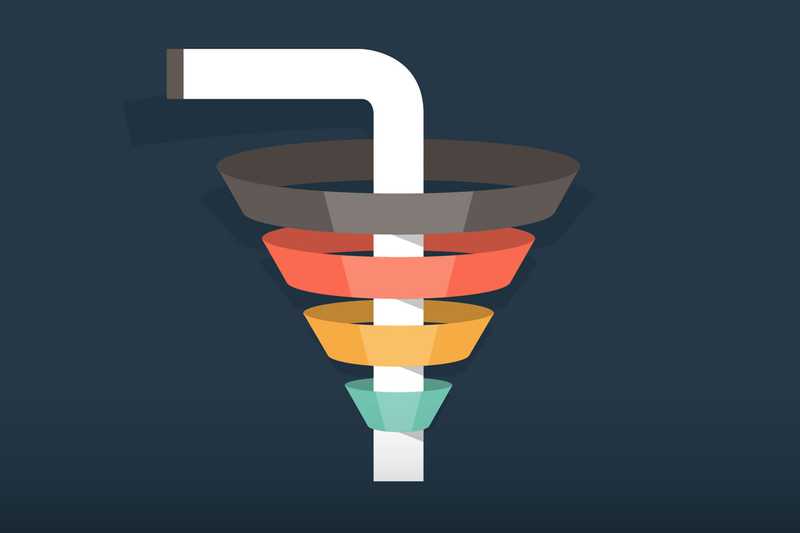 Your sales funnel should always be evolving, and adapting to your customers behaviors. Each business has different needs and requirements, so don’t worry about what your competitors are doing, focus on your needs and improving your funnel every day. While there is no cookie-cutter sales funnel for everyone, there are some guidelines that can help you begin the process, or improve your current funnel. All sales funnels essentially have four main areas of focus: Awareness, Interest, Decision and Action. Most funnels will have added levels based on specific sales goals and market conditions, but the overall idea is to attract your ideal customer and sell them your product or service. Let’s breakdown how a traditional basic funnel can work. Awareness: Located at the top of the funnel, potential customers learns about your products or services. They may also become aware of problems they didn’t know they had, leading you to help solve those problems. Customers will visit your website for the first time, hearing about your business from an ad, blog article, social post, word-of-mouth, etc. Interest: Your potential customer is now looking for a solution to their problems. They may be searching Google and that’s when businesses can enter through video or written content. Once the potential customer is interested in your product or service they may follow you on social, subscribe to a list or visit your business. Decision: At this phase, the potential customer is looking at your business to solve their problem. They are wanting to learn more about what you offer, and if your solution fits their budget. Now is a great time for sales pages, one-on-one interactions and listening to their specific needs. Action: The potential customer now becomes a paying customer. They purchase your product or service (or your conversion action). The funnel does not need to end here, adding more levels to produce brand loyalty and word-of-mouth advertising is a good idea. It’s now time to begin creating (or modifying) your sales funnel. The first place to start is with gathering data about your potential customer. Talk with them, ask them what their frustrations are and how you can help to solve them. You will gain valuable data and perhaps adjust your products or services to fit specific needs. Using all this data will help you to create content surrounding your solutions to those problems, leading to more qualified potential customers. You can then begin driving traffic to your website through paid advertising or organic reach. The latter cost money, the former costs time. Usually a balance between the two is a great solution for most businesses. Engaging your potential customers all throughout the sales process with video content, articles, and social media posts is a great way to increase conversions. No matter your sales goals, understanding your potential customers and how to solve problems they are having will lead to better conversions and increased profits. Each funnel will be different, and each demographic may need a slightly modified funnel from your “standard funnel”, but focusing on improving each level of your sales funnel is an important part of growth for every business. If you found value in this article please let us know. You can read the entire Digital Business series via our blog: http://golfwebdesign.com/blog.